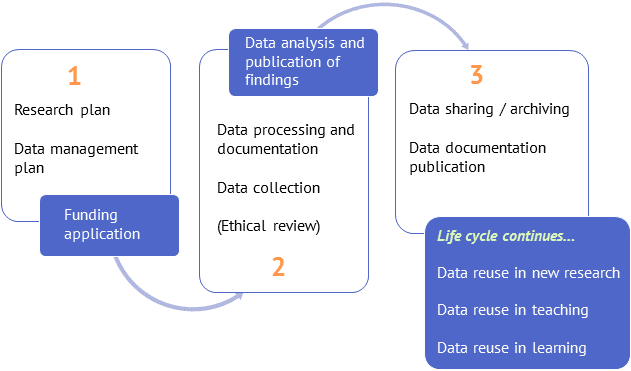 The open research process and the good management of the data are aimed at improving the possibilities of verifiability and repeatability of the research at various stages of the research life cycle. This way, the research results can be reused, evaluated, used in decision-making and secured by increasing digit data for future generations of researchers. To facilitate this, the Ministry of Education and Culture offers a wide range of Fairdata services, consisting of services that support the discovery, conservation and management of materials. Services that work well with one another but provide separate services are provided in the design of the data management, in the self-management of the material, in the descriptions of materials and in safe storage, and in ensuring long-term availability of important data. Services provide a number of benefits: firstly, the materials are safe for further use and have permanent identifiers for referrals. Secondly, it is easy to share the materials and find the materials for their own use. It is also easy to implement the requirements of transparency of research funding. When material is opened then its licensing needs to be taken care of. The results of the evaluation of the scientific quality of the application always have the highest impact on funding decisions, so it should be noted that international peer reviewers also appreciate open publishing, a careful inventory management plan and the opening of research data to a wider researcher when possible. For best rated applications, all of these are well described.